Knappe 4 für dieses Damentrio. Un titre urbain graisseux qui me fait penser à Brandy. Sowas lieb' ich wie Sau - zwei tolle Sängerinnen und dann auch noch eine gute Elliott sowie diese geile, kalte Atmo - 5-6 aufgerundet. Hot track. The beat and production is first class and really brings out the best in this all-star lineup. For me Fantasia still steals the show with that pre-chorus and chorus, so much attitude but class at the same time. I adore her whispery tone in the pre-chorus in particular. The inclusions of Kelly and in particular Missy are great too and add enormously here. 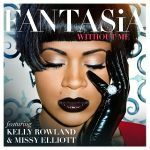 Fantasia's best along with When I See U.